DHARAMSHALA, November 25: Tibetan exiles today urged the international community to take action for the release of the 63 year old Tibetan lama, Tulku Tenzin Delek, currently serving life sentence in a Chinese jail. Tulku and his disciple Lobsang Dhondup were sentenced in connection with a series of bombblasts in Kardze. A thirty-minute long documentary film on Tulku, "Fearless Times of Tulku Tenzin Delek" was also released at a modest gathering attended by Tibetan Parliament's Deputy Speaker Khenpo Sonam Tenphel and members of Tulku Tenzin Delek Rinpoche Service Committee. “Although China has agreed to promote human rights as mentioned by UNHRC and it is for us to see how they do it. Tulku Tenzin Delek did nothing against the law of China but he is in prison for over a decade now,” said the Deputy Speaker. According to Tulku Tenzin Delek Rinpoche Service Committee comprising of people who have known him, Tulku has appealed his followers and supporters to continue working for his release. “You make appeals to authorities as much as you can. There are people who are making appeals for me, there are people who are talking about my condition getting worse. If there was a possibility to fall then I should have already fallen. You do appeal and campaign, anything that you could do,” Tulku Tenzin Delek had told his disciples during a prison visit November 6. Tulku Tenzin Delek is a highly revered religious leader and an outspoken admirer and follower of exiled Tibetan spiritual leader the Dalai Lama. Following a series of bomb blasts in 2002 in eastern Tibet, Chinese officials charged Tulku along with Lobsang Dhondup for carrying out the blasts. 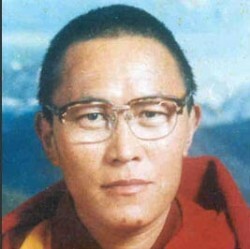 Lobsang Dhondup was immediately executed after a closed trial while Tulku was also given the death sentence with a two-year reprieve. The sentence was later commuted to life imprisonment on January 26, 2005 after an international outcry. In 2011, reports emerged that Tulku was suffering from a heart ailment. Tulku Tenzin Delek has a history of working for the welfare of local Tibetans in eastern Tibet. His initiations included improvement of healthcare, education and religious institutions. Tulku was also an ardent environmentalist and advocated for the conservation of the environment in the face of China’s rampant logging and mining in Tibetan areas.